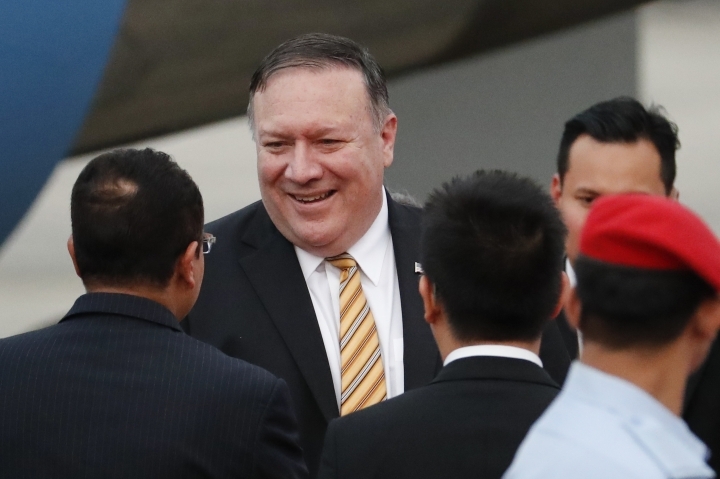 SINGAPORE — U.S. Secretary of State Mike Pompeo pressed Turkey on Friday for the release of a detained American pastor whose case has led the Trump administration to hit senior Turkish officials with sanctions and badly strained ties between the NATO allies. Pompeo also said he would be seeking the release of several local employees of the U.S. diplomatic missions in Turkey. Just two days after the administrations slapped sanctions on Turkey's justice and interior ministers over the case of Andrew Craig Brunson, Pompeo met with Turkish Forreign Minister Mevlut Cavusoglu on the sidelines of a Southeast Asian security conference in Singapore. Ahead of the meeting, Pompeo said Brunson's case would be high on his list of items to discuss with his Turkish counterpart. He defended Wednesday's sanctions as a sign of how seriously the administration takes Brunson's case. "The Turks were on notice that the clock had run out and it was time for Pastor Brunson to be returned and I hope they'll see this for what it is: a demonstration that we're very serious," he told reporters aboard his plane as he flew to Singapore from Kuala Lumpur, Malaysia. "We consider this one of the many issues that we have with the Turks," Pompeo said. He did not elaborate but Washington and Ankara have been at odds over numerous matters, including Turkeys's continued detention of three Turkish employees of the U.S. consulate in Istanbul, as well as military activity in northern Syria and Turkey's plans to purchase an advanced air defense system from Russia. "Brunson needs to come home as do all the Americans being held by the Turkish government," he said. "Pretty straightforward. They've been holding these folks for a long time. These are innocent people." Brunson is being tried on espionage and terror-related charges, which he and the U.S. government vehemently deny. Last week, President Donald Trump and Vice President Mike Pence threatened to impose sanctions on Turkey if Brunson was not immediately released. They said his recent transfer from prison to house arrest was not enough. Turkish President Recep Tayyip Erdogan has rejected the U.S. demands, saying his government won't back down and is willing to "go its own way" if the U.S. acted. The Turks have also vowed to retaliate for the sanctions "without delay." The Turkish foreign ministry called the sanctions a "disrespectful intervention in our legal system" that would harm "the constructive efforts toward resolving problems between the two countries." Speaking to Turkish journalists after his meeting with Pompeo, Turkish Foreign Minister Mevlut Cavusoglu described their discussion as "extremely constructive" and said the two would continue to work toward resolving disputes between the two countries. "We repeated to them that nothing can be achieved through threatening language and sanctions and we believe that this was well understood," Cavusoglu said. Brunson, 50, was arrested in December 2016 following a failed coup on charges of "committing crimes on behalf of terror groups without being a member" and espionage. Although he was released to home detention, he faces a prison sentence of up to 35 years if he is convicted on both counts at the end of his ongoing trial. The evangelical pastor, who is originally from Black Mountain, North Carolina, has lived in Turkey for 23 years and led the Izmir Resurrection Church. Under the sanctions to be imposed by the Treasury Department, any property, or interest in property, belonging to Justice Minister Abdulhamit Gul or Interior Minister Suleyman Soylu within U.S. jurisdiction would be blocked. Americans would generally be prohibited from doing business with them. Erdogan has denied speculation that there had been an agreement to swap Brunson for Turkish citizens being held abroad, particularly 27-year-old Ebru Ozkan. Ozkan had been detained by Israel on terror-related charges, but was deported to Turkey this month. The Turkish leader previously connected Brunson's return to the U.S. to the extradition of Fethullah Gulen. Ankara blames Gulen for the coup attempt, while the cleric denies involvement. Erdogan has also warned that Turkey would seek international arbitration if the United States refused to deliver F-35 fighter jets in retaliation. Akhbar Harian is your minute-to-minute update on Malaysian news keeping you in touch within the local community or in another state. Copyright © 2015 - 2019 Akhbar Harian. All Rights Reserved.